MEET THE FIRST FULLY AUTOMATIC, LARGE FORMAT EMBOSSING & DIE CUTTING SYSTEM, THE EBOSSER. Available in white with the Regency Embossing Folder from Craftwell, or the Teresa Collins edition with the About Time & Sophisticated Embossing Folders from the Teresa Collins Collection. 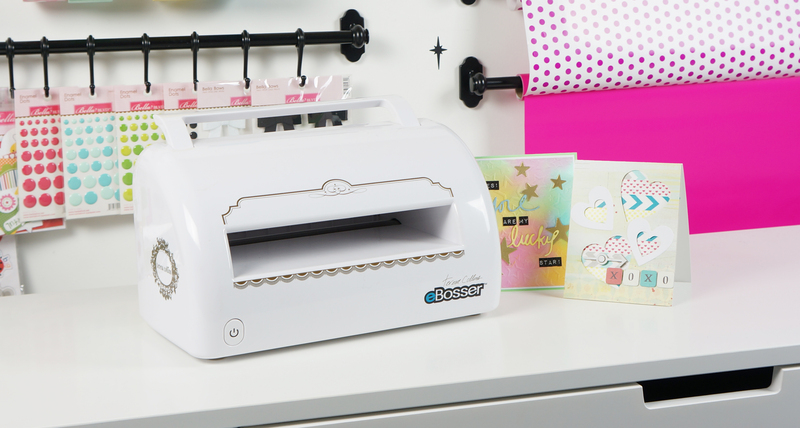 The eBosser is a one-step automatic embossing & die cutting system that easily cuts or embosses materials up to 8.5 inches wide & 12 inches in length. Cut through multiple layers of fabric or simply cut or emboss different materials such as metal, wood or leather. So spend less time cutting & spend more time creating! Do YouThink that machine si compatible with the Gopress and foil machine ? Thank you for your question. We’re not too sure if the Gopress and foil machine is and will have someone test it out. Thank you for contacting us. You can use the Sizzix Bigz Dies for wood and combination with the eBosser. Hi Therese, thank you for interest in Craftwell products! You can contact Customer Support at cs@craftwellusa.com, and they can help you with that. Brilliant machine, had one of the first design when it came to uk still going strong. Would give it 5 stars. Will the replacement plates for the cut and boss fit my ebosser? The plates/platforms for the Cut’n’Boss are compatible with eBosser, but you would still need Platform C and the Cut’n’Boss replacements doesn’t come with it. Hi. how does it differ from cut n boss? Which between d two will u recommend?